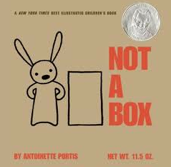 I was excited that Rachelle from TinkerLab asked me to be involved with her Creative Challenge involving making something with a cardboard box! This Collaborative Cardboard Box Challenge is celebrating her blog's one year anniversary! Her original post can be seen here. Many other bloggers (many I am honored to be associated with!) are involved so I hope you check everyone's idea out in the Linky below! Instead of keeping the box together we decided to cut the box into shapes to create a sculpture! 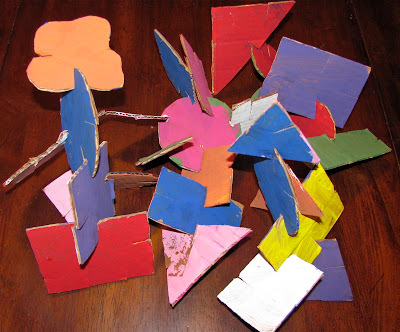 I had to cut the shapes because a cardboard box is much too difficult to cut for a preschooler. I used heavy duty scissors, but you could always use an exacto blade! The heavy duty scissors were quick and easy though! I asked Cassie what shapes she would like and I cut them as she told me! After the shapes were cut out Cassie painted all the shapes! She really enjoyed this! There were lots to paint! On one day Cassie painted the first side of the shapes and the next day she finished the other side since the sculpture can be viewed from all angles! After the shapes were painted, we had to decide how to put them together? Gluing was too difficult so I cut slits into the sides of the shapes so that they could be easily linked together. 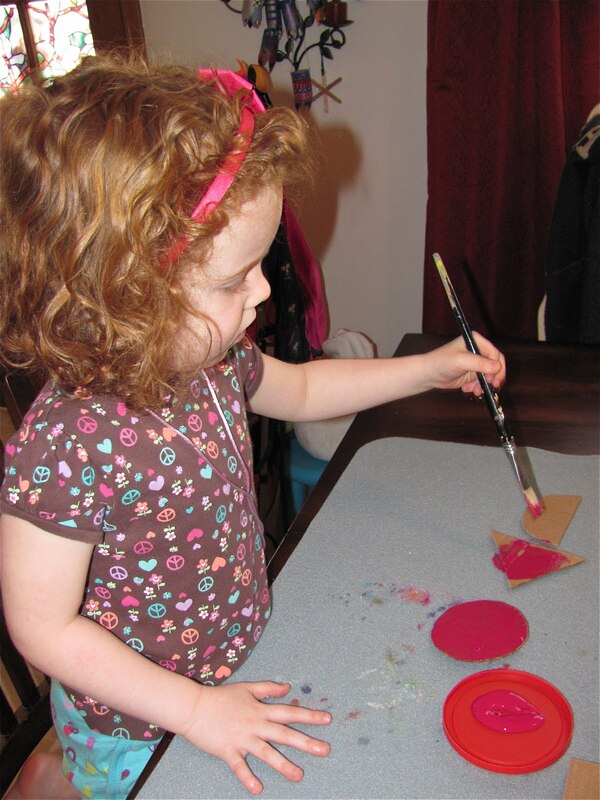 I began by showing Cassie how to put the shapes together. I started making a sculpture and Cassie said, "Those are my shapes...I'm suppose to be building!!!" Sometimes the best motivator is when a child sees you making something! This works for eating different foods too! Cassie is truly concentrating here! As you can see to the side Cassie already built two sculptures! She was having a lot of serious FUN! One tip: Make sure to hold the shapes close to where you are joining them so they don't bend! It was funny because Cassie started mimicking me and telling herself the steps on how to join the shapes! Cassie: "First you...and then you...."
Here is one sculpture close up. Cassie started imagining what some of these sculptures looked like. She thought most looked like birds and elephants!!!! Silly girl! GREAT IMAGINATION!!! I think the sculptures looked the best all together! It looks like one giant Abstract sculpture! Yes, Can you believe Cassie created all the sculptures! She even made me take apart mine so she could build her own! This was a highly motivating project for Cassie! 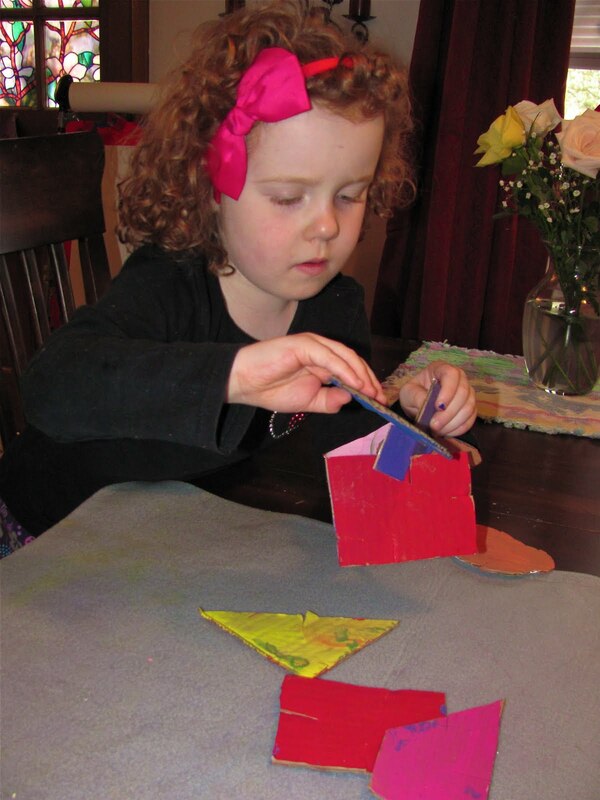 She loved picking the shapes, painting the shapes, and especially building with the shapes!!! All around success! I hope if you decide to try this it will be as successful as it was for us!!!! *** Check out these Great Variations of this kind of project at this great post by Putti Prapanacha: Building With Slotted Cards and Discs!!! You won't be disappointed!!! You will be amazed!! This is perfect! I always struggle with finding ideas for sculptures but this is so simple it is perfect! Yay, this is a great idea! It's also small enough that you can toss it into a baggie and take it on the road in case you are in waiting room a little too long! hahaha!! This is fabulous! This really reminds me of an artist's sculptures but I can't remember the name. Will try and find out! Did not include in my box challenge post bcos as it is the post is long! I love this idea. Little Cassie looks so engrossed! And the result is so colourful and beautiful! I am completely impressed by Cassie! But I agree, sometimes you gotta do it first (first of all to show them how, but secondly, because like you said - its a motivator for some reason) to get them to try it. Its always more fun when you have someone to do it with anyway! How interesting! We have a building game like that, and Anna always enjoyed building with it, but all the shapes are the same shape. It never occurred to me to build something of my own. I find a lot of excellent ideas on your blog! Melissa, you've done it again! Isn't it funny when our kids mimic us? I've wanted to try this idea out (I think we touched base about it) and I'm so glad you've tested it for me :) That was your plan, right? When we made gumdrop sculptures, my daughter also took all of my sculptures apart in order to use the pieces for her own. We have some strong-minded first-born kids, don't we? Were you inspired by the cardboard playground? That's what your wonderful project made me think of...smaller scale of course. Great idea! I tried something similar with card stock and construction paper. 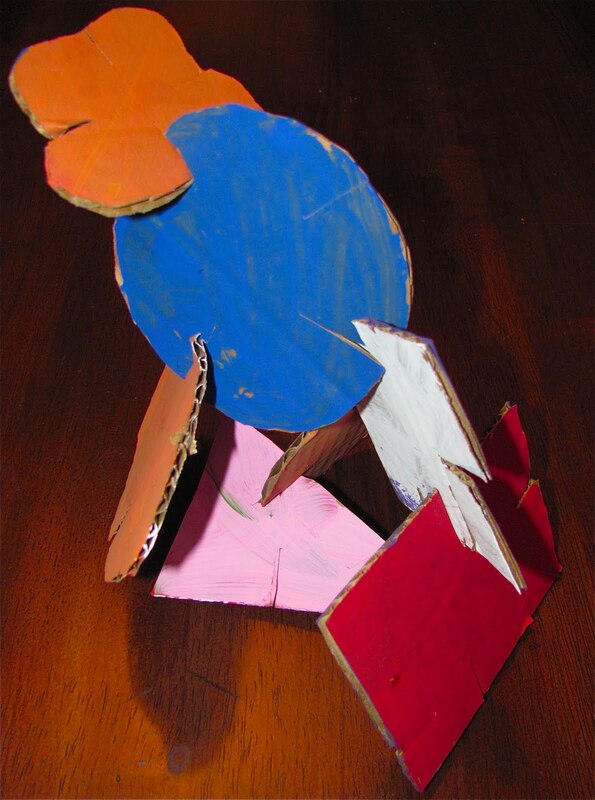 The pieces were so flimsy the sculpture wouldn't stand up. I am so glad you showed me how to make it work! What a brilliant idea! We are definitely doing this. I laughed at Cassie's comment "Those are my shapes!" That is EXACTLY what my son will say when I demonstrate these to him! Good idea and post, Melissa! You describe Cassie verbalizing her process as she worked, and mimicking your words. This is something I've noticed my children do so much over the years. Just yesterday I was reading an interesting insight by Lisa Murphy, in her book, Play: The Foundation that Supports the House of Higher Learning. Well, how may times have we all seen this in action? But I've never really thought about it as a developmental norm of language aquisition. I love this sculture idea, and will do it sometime soon with my children. Ooooh, I love it! Gotta try this. I am a big fan of art from recycled materials especially with kids who are just glad to create and play!! Just wanted to share that we made your fun flower bottle suncatchers. Pics at cowsgomooandducksgoquack.blogspot.com Thanks so much for your artfulness and for inspiring some of ours! Another wonderful idea! I can't wait to try it out! Love this! I'll have to try it too, although you inspired me to try it on a large scale with some huge boxes we had on hand...check it out! Thanks everyone for the compliments! What a great idea & so easy on the resources! Thank you so much for linking to the RC! That`s an excellent idea! Fun and exciting! Can`t wait to show to my daughter. She will love it! This is so cool. I love how you can pull it apart and make it again in all sorts of different shapes. Hi there... You've been walloped by the wand of the Art Fairy! (again) I loved this tutorial so much that it made the Weekly Top Twenty at the Art Fairy. Stop by an pick up a button if you get a chance. What a great way of adding some imagination to painting! I know I have way too many exclamation points and have cut back in my most recent posts.